Our projects are in free access, but only for home/non-commercial purposes. Please write us in any other case. File of smaller size, for viewing on computer only. Picture: 1024x768, full screen. Sound: 192 kbps / 44 KHz / stereo. File of bigger size, optimized for TV. Picture: PAL 720x576 / XviD, 8000 kbps. File of smaller size, for viewing on computer only. There wil be no EXE version since we have changed the technologies from slide show to video editing. Films 1-3 in EXE format. The size of two last films is quite big for 20 min, but here we have still photos instead of video. Comparing stills and video with same compression, the moving picture gives an impression of better quality. That's why we have decided to inscrease the file size and raise the image quality. 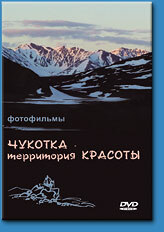 The films are based on photos taken while travelling through different areas of Chukotka. We tried to combine in them music and artistic production, ideas and feelings, - all those great emotions which attach us to the beauty of this territory. Each film is unique, unlike the other, but they are all united by the wonders of Chukotka, by the miracles of its nature. First there was a plain slideshow made of pictures taken while travelling in Chukotka in summer of 2004. 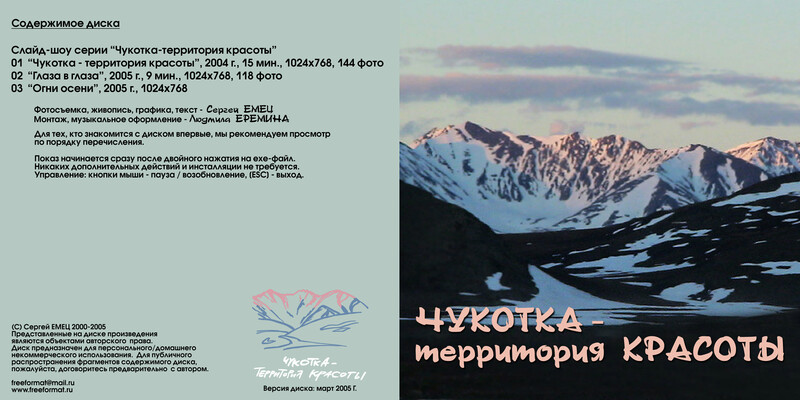 It was shown on the opening ceremony of our art exhibition which was also called "Chukotka - the Territory of Beauty", held in Moscow on the 17th of December 2004. Very soon we became being flooded by admired feedback and requests to make a copy. As a result we made a series of slideshows gradually transformed to being named as photofilms. There is a Territory, lost in time and in frosty lands of the North. Its magnetic energy attracts generations of the scientists and travellers. But it hides inside not only its treasures, the misteries of discovery and severe climate. It is full of radiating Beauty. Whoever came here even once in the life and immersed himself to the endless horisons, will love this Territory of Beaity. through winds, snowstorms and frosts. and to this eternal Chukotka's landscape. and saying goodbye to summer? and territory of extremely low temperatures. to the city and to all the region. Paintings The paintings of series "The Splinters of Chukotka's Landscape"
Photoblogs (in Russian, please use online translator) Items with tags "Chukotka"